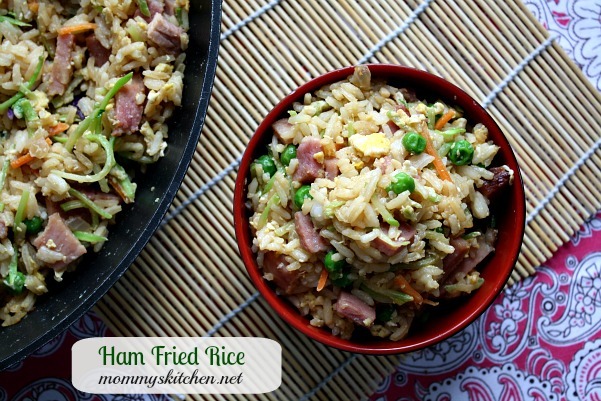 Recreate Leftovers into a totally different meal with this simple Fried Rice with Ham. Rice is fried in a hot skillet along with coconut oil and sesame oil, then mixed with onions, fresh ginger, peas, edamame, eggs, soy sauce and plenty of ham. I hope everyone is having a wonderful morning? I finally used up all of the leftover ham from Easter. We put a pretty good dent in the ham itself, so there wasn't really too much to freeze. I think I had just enough to make two additional meals. I used the ham bone with all the yummy ham bits to make a big pot of beans. Northern Beans is one of our favorite meals to make when we have leftover holiday ham. I love to take leftovers from one meal and turn them into a whole new dish. It surprises me at what you can come up with. 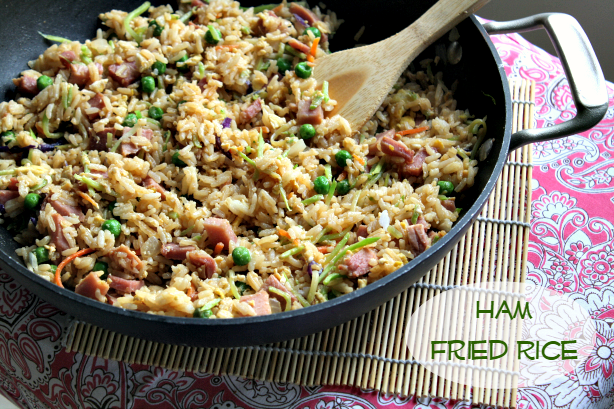 I had less than 2 cups of chopped ham left, so I made Ham Fried Rice which turned out fabulous! I actually think any type of leftover meat would work in this recipe (chicken, pork or beef). You can use white or brown rice, so it's really versatile. I have to admit it comes pretty darn close and taste just as good as take out fried rice. I think next time I will try adding some edamame and see how that goes over. Crack eggs into pan and scramble, mixing throughout the vegetables until the egg is cooked. Add rice and ham, stirring, until heated through, about 1 minute. Remove from heat and gently stir in the soy sauce and teriyaki sauce. Serve immediately. Cooks Tip: When making fried rice it's best to use day-old or leftover rice. If you don't have any on hand, prepare a batch early in the morning and store in the refrigerator until ready to use. I have included some step by step photos to show you how easy this dish is to prepare. It's funny that you posted this. I made the same thing, only with left over chicken. Great minds think a like. I think fried rice is great with any type of leftover meat. I bet your chicken fried rice was good as well. Looks wonderful! 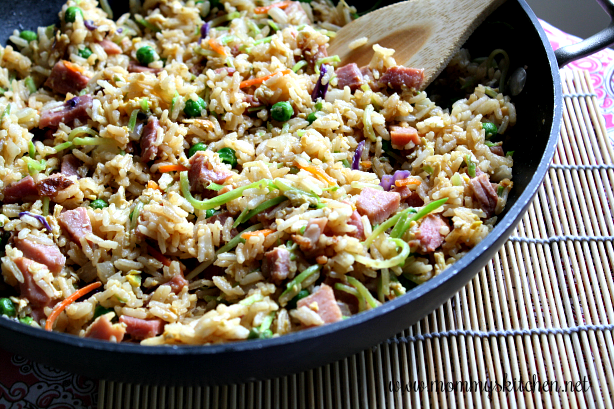 I've never made it with ham but do LOVE some fried rice. Thanks for sharing - great tutorial! I just made this last night and the only thing I changed was the rice. I used yellow rice and it was awesome. Great recipe. I "lost" your blog a while back after my computer crashed. I had it saved in my "favorites" and could not remember the name of it! I rediscovered it today after I found one of your recipies I had printed out and stuck in a cookbook. I am so glad I came across it again! You have some great recipies and I can't wait to use some of them again soon! I can't get the pin it button to connect. Didn't work on the ham and black eyed pea soup either. Help!